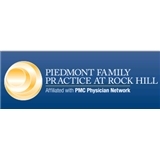 Piedmont Family Practice at Rock Hill (Rock Hill) - Book Appointment Online! Board-certified in family medicine, Eric Johnson, MD, provides advanced care in a patient-focused environment and has served the Rock Hill community for more than 30 years. Our services include diagnostics, health screenings, treatment of illness and minor injuries, immunizations, preventive care, geriatrics, routine physical exams and care for chronic conditions such as diabetes and hypertension. Dr. Johnson can care for every member of your family, from infants to seniors. Dr. Barron is the kind of doctor that teaching hospitals should use to train new family practitioners. He has been our family doctor for 19 years and I would not even consider going to anyone else. Very thorough and direct. Definitely recommend! She was very patient and understanding. I felt comfortable in her care. I was slightly nervous going into the office today but..as soon as I was introduced to Dr Rettell I felt comfortable! Dr Rettell was very professional and had a lovely friendly approach. I will look forward now to seeing her in 4 weeks time!